I decided to start attending boot camp with Tonya in February 2014. For the past two years, I watched my wife, Shevonne get up four days a week and attend class. It was easy for me to just lay there and sometimes go back to sleep. Then I noticed her results. After I lost 20 pounds in 2012, I noticed the pounds starting to add back on again. I made the conscious decision of making a change in my life. I started attending the Burlingame boot camp with my wife Shevonne. I can honestly say that there is not a boring moment there. Although one longtime boot camper has said “men don’t usually stay in this class”, I’m proud to say that I signed up for another year. At first I gained weight in the class (all muscle of course). That was frustrating. Then I started making changes in what I eat. Although I consume a protein shake every day, regardless of if I work out, some of my food choices were not smart all the time. The snacking on Hot Tamales or Mike and Ike’s was an all day event. My portion sizes for my meals were unreasonable. Making these couple of adjustments helped, but the real change came when I started making protein smoothies, eating a larger, more nutritionally sound breakfast, a reasonable lunch that I prepared from home and a light dinner. It seemed like the pounds were melting away and this was all in time for the January [body transformation] challenge. With the boot camp workouts I increased my dead weights to 50 pounds and I use either the 20 or 25 pound medicine ball. Also, at the end of each class I do 30 sit ups with a medicine ball to increase my core strength. 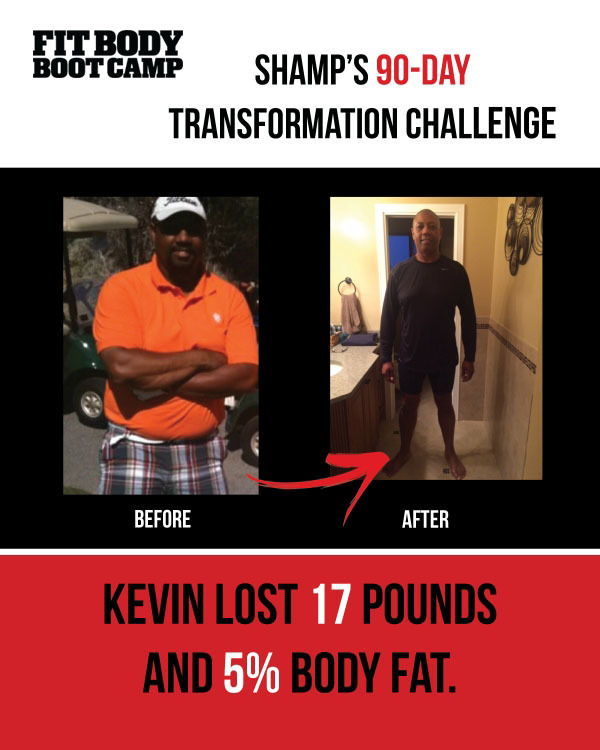 My starting weight for the challenge was 255 lbs and 31% body fat. I am now 238 lbs and 26% body fat. My goal weight was originally 230 lbs, but I would like to see how far I can take this weight loss journey.